Home » ARE YOU SCHEDULING YOUR MARKETING EFFORTS LIKE YOU DO YOUR WORKOUTS? ARE YOU REALLY CONNECTED TO A MARKETING STRATEGY? I’ll bet you can tell me exactly when you last did a cardio workout. I’ll bet the same of your next strength training session. When will it be? 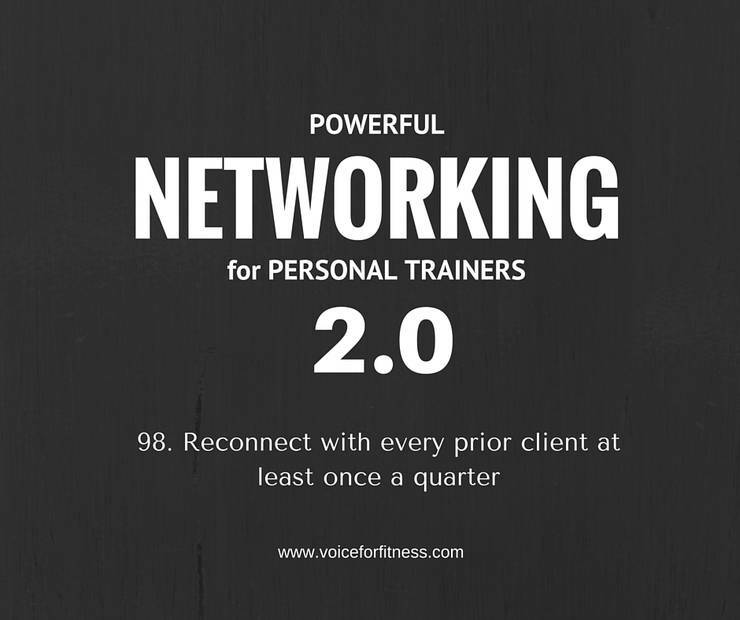 Can you tell me the same about when you are next due to connect with your prior clients? Without fail this is the #1 blooper of fitness professionals. We seem to have our eye on the next one but we forget the one who was with us, was happy, liked our services, and ended their sessions and the current need that they had. Yet, we all have different needs over time. I have five pairs of dress pants in my closet, but I don’t have any that are really in style and I love. I have a weight training routine I do when I’m stuck at home snowbound or with too little time to drive down the mountain, but I don’t look forward to it. Last season I needed functional training for triathlon and this season I need to increase weight for strength and power. Your prior clients have changing needs, too. Reconnecting makes them realize it. Or, having already realized it and been thinking they needed to do something about it, your call will come at just the right time. Earlier this year I shared some news with my subscribers about the lifetime buying cycle of many clients. It’s true that a small percent of customers will buy the first time they connect. They’ve done their research on you online already or they got a direct referral from a trusted friend. They say someone else with results they want that works with you or they got a “do this or else” from a doctor. But up to 50% or more of your customers won’t buy for another 180 days. IF you nurture them. If you don’t, they’ll buy, but from someone else. The time isn’t right. They are slow processors. They never act quickly. For some of us that drives us crazy (me!) For others, it is us. Yet, we skip over the need to nurture that relationship. That is, we don’t continue to send them valuable information specific to the reason we connected with them. The error a lot of trainers make with their email lists is that they don’t segment lists. They put everyone into one pot and always send them the same stuff. That doesn’t feel even like the big Pottery Barn reaching out to me knowing when I made my last purchase was too long ago. I’m guessing that system is triggered every 6 months. What triggers do you have set up? And what specifically do you do with a lead who said “no” today but didn’t say “never!” – how are you following up each month at least or bi-monthly with specific information about the need for regular exercise, details about how to implement, why to implement, and technique strategies they can use even at home? Then what are you doing to trigger a mailing or a phone call by a staff member reaching out to this group of not-yet buyers? As I write this post, it’s December. It’s a perfect time to be reconnecting. But if you haven’t nurtured them they aren’t opening that mass email. You need to call them. You need to take “unopens” and move them off your list and attempt some other way to re-engage. This is valuable hourly time. Trying to come up with an idea to get new people in the door for the first time is really less of a warm lead and a longer shot. Someone has already told you, “I’m interested,” if you’ve seen them. Follow up. Regularly and consistently. The words of struggling businesses are…”I have done that but I haven’t done that in a while.” You don’t want to have to remember to market. It should be the #1 priority in your business. You have to get them in….before you can service them. Once you get them in, you have to keep them in.